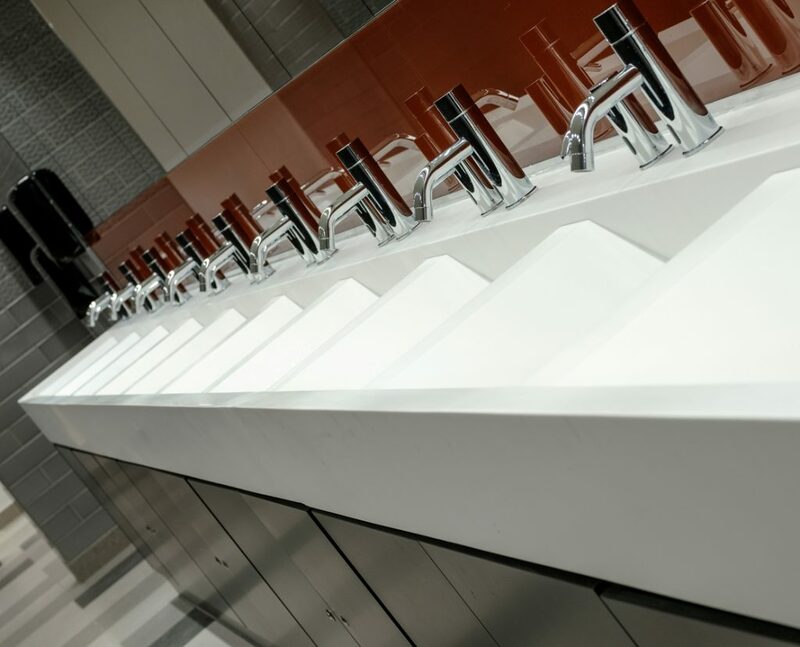 We’re proud of the striking washroom designs we’ve created for our commercial sector clients throughout this year. Drawing on our full product range as well as our love of bespoke design, innovative materials and design solutions we’ve delivered numerous truly unique washroom spaces and here’s a selection of our favourites. This office washroom features a stunning combination of brass and marble. The brass effect accessories including wall-mounted taps, coat hooks and cubicle locks, together with the marble vanity splashbacks and marble faced Concerto duct tiled panelling with brass trim, creates a stand-out washroom space. We also installed our full height Alto toilet cubicles, in a matt finish oak veneer. 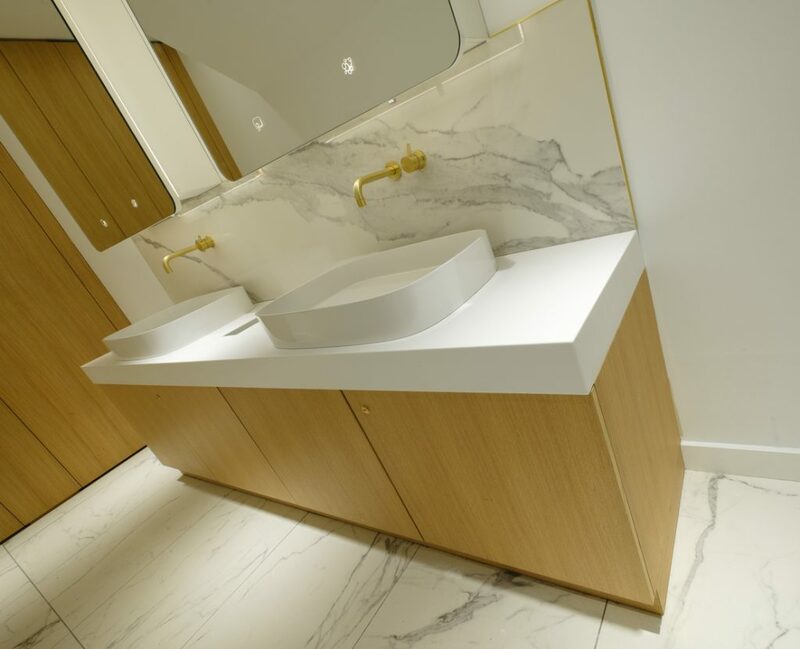 The result is a one-of-a-kind washroom, perfect for the building which provides flexible serviced office space for companies in the heart of Mayfair. Working with solid surface materials such as Corian gives us design versatility to create vanities in almost any shape, as this stunning wave effect Corian vanity unit demonstrates. We created this unique Corian trough vanity unit and back-painted glass splashbacks for the Intu Watford shopping centre as part of a refurbishment at the centre this year. 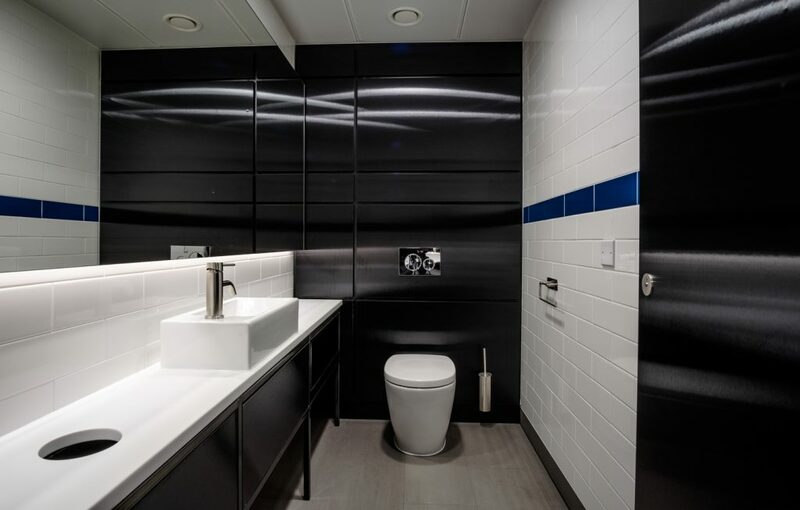 This is a stunning example of a superloo featuring our Concerto integrated duct panels which we faced with black brushed metallic effect high pressure laminate. Completing the sleek design are the bespoke Corian vanity units with integrated waste bins and countertop china basins. It offers the perfect balance of stylish design and durability making it perfect for this Camden office. 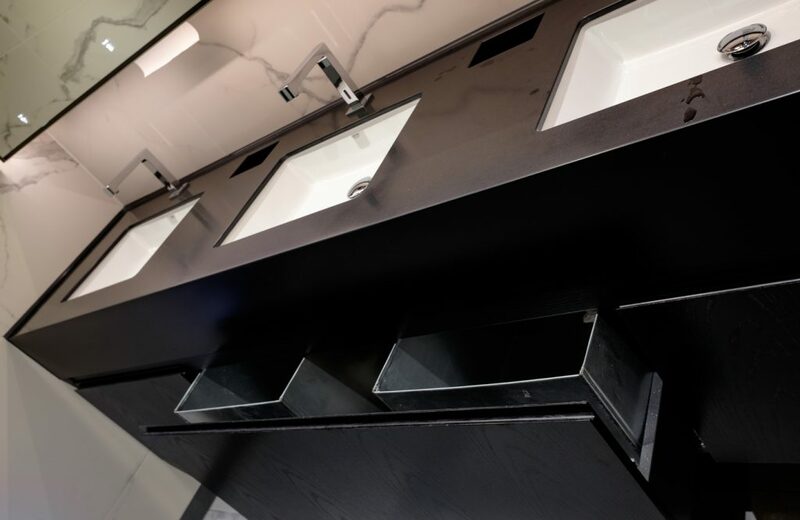 For this office washroom refurbishment, bespoke Corian vanity units were specified in ‘Deep Anthracite’ to match the slate grey ash effect veneered Alto toilet cubicles which were wrapped in innovative architectural film as part of our new Washroom Refresh service. Balancing practicality with style, the washroom also features our Tego hinged storage mirrored units above the vanities plus bespoke pull out drawer units. Based in the heart of Clerkenwell, this distinctive 1970s office building has been fully refurbished this year and we provided new washrooms to complement its brand new interior design. 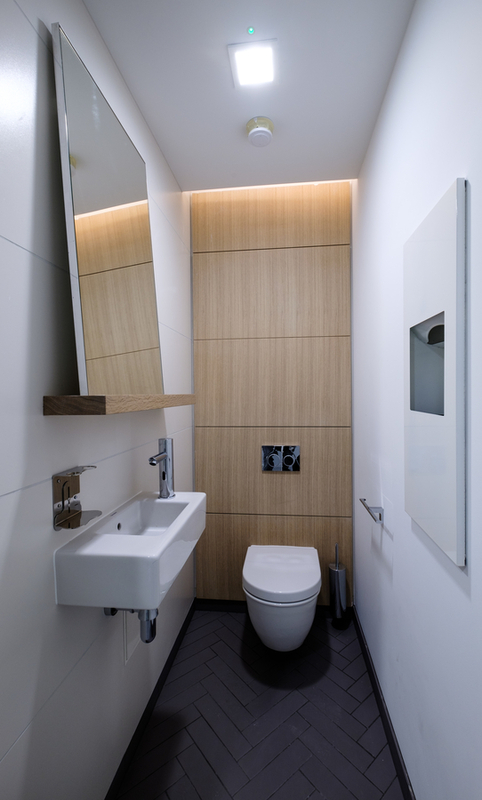 Each self-contained superloo features our Concerto integrated duct panels faced in Pale Limed Oak veneer and mirrors fitted onto bespoke grooved shelves, which were manufactured in the same Pale Limed Oak finish.